The people whose dreams, courage, terror, ingenuity, and fate we share are James Frazier Reed, one of the leaders of the Donner Party, and his wife and four children—in particular his eight-year-old daughter, Patty. From the moment we meet Reed—proud, headstrong, yet a devoted husband and father—traveling with his family in the "Palace Car," a huge, specially built covered wagon transporting the Reeds in grand style, the stage is set for trouble. And as they journey across the country, thrilling to new sights and new friends, coping with outbursts of conflict and constant danger, trouble comes. It comes in the fateful choice of a wrong route, which causes the group to arrive at the foot of the Sierra Nevada too late to cross into the promised land before the snows block the way. It comes in the sudden fight between Reed and a drover—a fight that exiles Reed from the others, sending him solo over the mountains ahead of the storms. We follow Reed during the next five months as he travels around northern California, trying desperately to find means and men to rescue his family. And through the amazingly imagined "Trail Notes" of Patty Reed, who recollects late in life her experiences as a child, we also follow the main group, progressively stranded and starving on the Nevada side of the Sierras. Snow Mountain Passage is an extraordinary tale of pride and redemption. What happens—who dies, who survives, and why—is brilliantly, grippingly told. 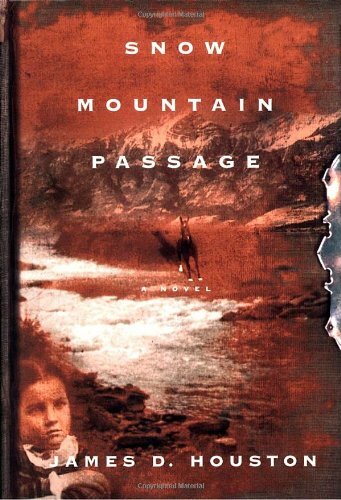 Snow Mountain Passage is a novel about the Donner Party. Still reading? Never fear, this is no corpse fest along the lines of Piers Paul Read's Alive, and its concerns are anything but prurient. For James Houston, who has written movingly about California in the past, the Donner Party's experiences exemplify the ambition, the courage, and the sheer hubris of those who ventured into territory as unfamiliar to them as the moon. His book is not just a blow-by-blow account of what went wrong and who ate whom, it's a searing portrait of both the promises and the perils of the American dream. My body was like an empty bottle sitting on a dark shelf in an empty cupboard. A cold sun was shining. While we stood there the wind came up, rushing through the pines with a sound like surf, a gushing roar like water on the rise, as if an ocean of ice water had begun to pour across the world.